When it comes to the grill, everybody has their favorite tips and tricks that they utilize to tell when a burger or steak is done. For some, it is a matter of waiting for the juices to bubble on a burger or using the touch-test for steak. But when it comes to other foods, knowing the tricks can get a bit tricky. 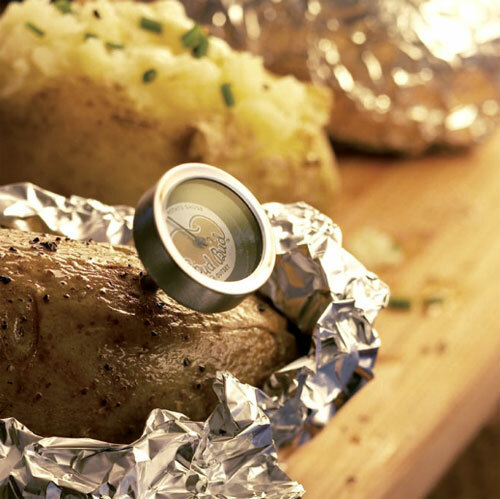 For grilled baked potatoes, the Spud Buddies Potato Grill Thermometers can take the guesswork out of when to pull them off the grill. Of course, there is the time-tested trick of just removing them when they explode, but the thermometers are probably a less messy option. If you have been to any state fair in the recent past, you have seen it: the tornado potato. The spiral-cut deep-fried treat can be found wrapped around a hot dog or just served on its own. For those that find themselves unable to resist the lure of the barkers, and hence try to stay away from the midway, there is another option. 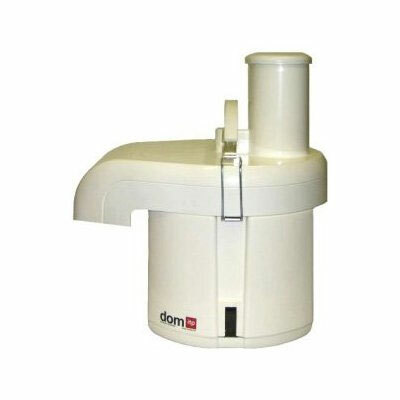 Now, with the Gold Medal 5280M Motorized Ribbon Fry Cutter you can have the flavor of the carnival in your very own home. Curly fries may have been the last great excuse to rationalize a trip to a fast food restaurant. After all, they aren’t exactly easy to make at home; at least not with a kitchen knife. 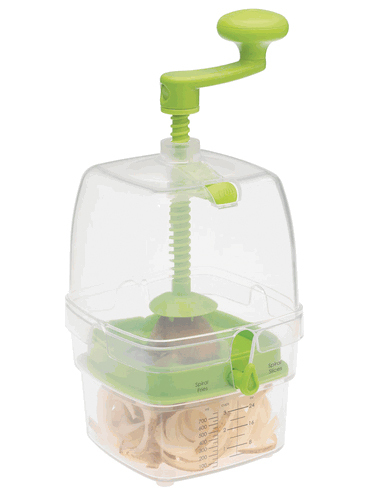 With the Curly Fry Cutter by Progressive International on hand, the dastardly delights can always be just a potato away. With stainless-steel blades and a unique threaded rod, the 3-cup capacity cutting tool makes quick work of a pile of potatoes. Capable of making slices or a continuous spiral of potatoes or yams, the kitchen gadget makes it easy to prep distinctive creations ready to drop in the deep fryer. And as the cutter is top-rack dishwasher-safe, even the old excuse of not wanting to do the dishes can’t be used to promote a trip to the drive-thru. There’s something extremely comforting about knowing what things are what. Some of us like to have this information explicitly spelled out for us. However, these Potato Scrubbing Gloves may cause some confusion. Although they are clearly marked “potato”, I don’t believe they would fry up too nicely. 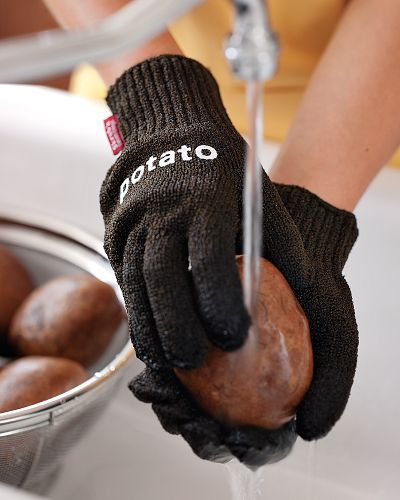 If you don’t want to risk being labeled a potato yourself, veer away from these somewhat confusing gloves. As a side note, there’s a joke in here somewhere about Dan Quayle not wearing his potato mittens to school as a child, but I’m too lazy to find it. Hmm… seeing as that is such a couch potato maneuver, maybe these gloves aren’t such a bad fit after all! Lately I’ve had potatoes on the brain. A recent trip to Barney Greengrass led to some delicious latkes (which always has a ripple effect), while in San Francisco I just discovered a recipe book that called for potato pancakes to be made with Swiss and cream cheese. Sacrilege? Maybe. But delicious too. The amazing potato goes well in so many recipes; you can’t really go wrong. 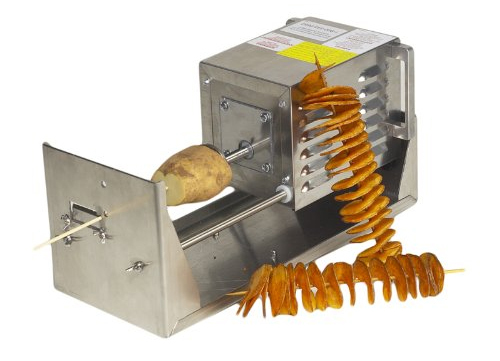 So in honor of this potato obsession, today I find it necessary to show off a potato-related kitchen gadget. Since we are talking about the Old Country (take your pick), it seemed appropriate for a Retrosink post. 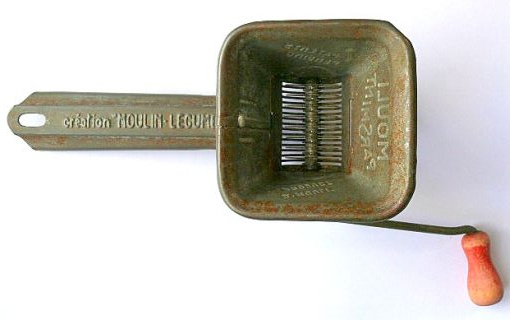 Hence we have the Mouli Parsmint “Creation Moulin-Lecumes” grater.